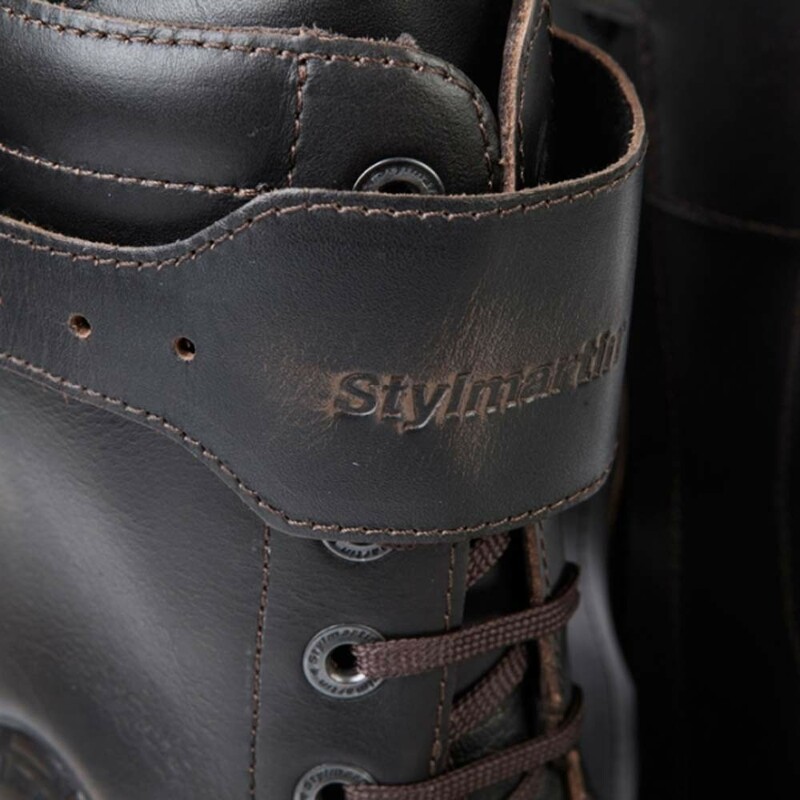 The Rocket boots from Stylmartin are a cafe racer style longer length motorcycle boot made from full grain writer leather. 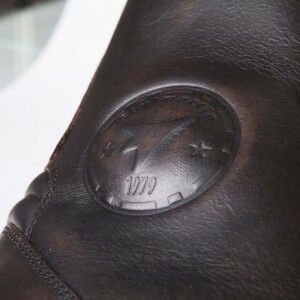 Writer leather intentionally marks very easy to give that aged effect. If you prefer to keep the leather nice and clean just polish regularly. There is a waterproof and breathable lining to ensure your feet stay warm and dry and there is protection on both sides and a leather gear change protector also. 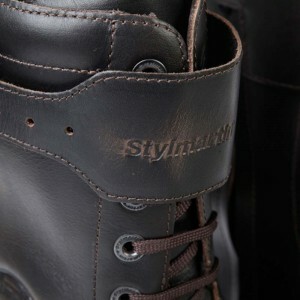 The Stylmartin Rocket has dual fastening, laces and zip. The zipper goes all the way down to the instep so it's a breeze to quickly get in and out of these riding boots. 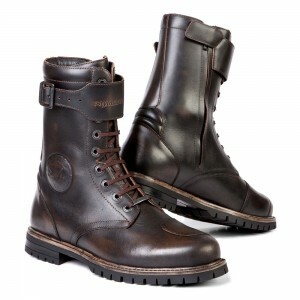 Pair up with some Resurgence Cafe Racer Jeans for that great cafe racer style! I've had mine for about a year now and where them most everyday. They're getting broken in and looking even better, but most importantly they are super comfortable. Well made and came just in time for the "Beast from the East Part Deux". My feet was warm, dry and looked great. Its week one and my only gripe is the stiffness around the ankle but this will resolve itself with wear. Lovely colour also. Definitely a good investment. We're really glad you're enjoying the boots, ride on! These boots are exactly as advertised. Amazing quality. Felt like a perfect fit from the moment I put them on, hardly noticed any stiffness or discomfort, as if they had already been broken in. And yet the are thick and hardy, if it were not for their beauty, I wouldn't think twice about using them as everyday boots for work. On top of all of this, The Cafe Racer is selling them far cheaper than any other site I could find, and even though I'm in America, they arrived almost unreasonably and irrationally quick. A purchase I certainly do not regret, and I'm sure they'll be with me for a long time to come. Bike looks the biz with these on! Best boots I've ever owned. I don't normally write reviews as never have time or inclination but these really are out of the top drawer. Boots feel as though they will definitely help if i had an off. I was wearing Timberland style boots before so I'm so glad I made the swap to boots with safety features. 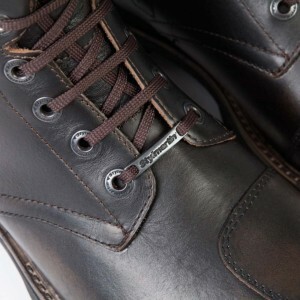 Thought that safety features may make them really uncomfortable but while these were quite stiff to start with they are now perfectly comfotable and you can put them on withought having to do the laces up. Really happy with these - thanks. These finally arrived after what seemed like an age after you ran out of my size. Glad I waited and didn't go for anything else as they feel super tough and fit for purpose. A little too stiff to start with if anything but after wearing for 5 or 6 trips they're breaking in quite nicely. Don't expect a skinny lightweight boot as these are quite heavy duty.